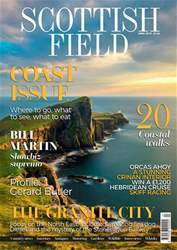 Scottish Field: Scotland's award winning, glossy, lifestyle magazine. Pay £9.99 quarterly and never miss an issue of your favourite magazine. Pay £48 by credit or debit card for 1 year (12 issues). Pay £59 by credit or debit card for 1 year (12 issues). Warners Group Publications provide and support the payment platform for Scottish Field.